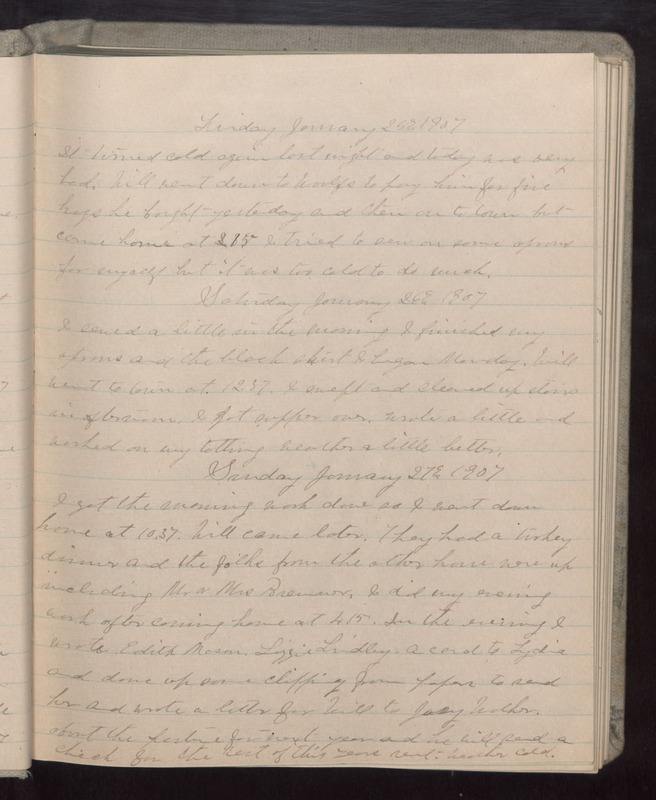 Friday January 25 1907 It turned cold again last night and today was very bad. Will went down to Woolfs to pay him for five hogs he bought yesterday and then on to town but cam home at 2.15 I tried to sew on some aprons for myself but it was too cold to do much. Saturday January 26 1907 I sewed a little in the morning I finished my aprons and the black skirt I began Monday. Will went to town at 12.57. I swept and cleaned up stairs in afternoon. I got supper over. Wrote a little and worked on my tatting Weather a little better. Sunday January 27 1907 I got the morning work done so I went down home at 10.37. Will came later. They had a turkey dinner and the folks from the other house were up including Mr & Mrs [Bremer?] I did my evening work after coming home at 4.15. In the evening I wrote Edith Mason. Lizzie Lindley. A card to Lydia and done up some clipping from papers to send her and wrote a letter for Will to [Josy?] [Wother?] about the pasture for next year and he will send a check for the rest of this years rent. Weather cold.